We facilitate Solar Commons demonstration projects with community partners interested in supporting clean energy and social equity for low-income communities. Over the coming years, we will work with community partners who are prototyping and refining the legal structure of Solar Commons' low-income community solar trusts . The Vermont Law School Energy Clinic, our key collaborator, is creating open source templates of Solar Commons community trust prototypes. We will make these templates freely available to the general public on this website. By testing Solar Commons in diverse electricity jurisdictions and for varied community benefits, Solar Commons demonstration projects will prototype and lead the way for local nonprofits and solar installers to use the Solar Commons model in new and creative ways that best fit the needs of their specific communities. The Solar Commons nonprofit will itself serve as a prototype for researchers designing the new function of a community solar “trust protector”—a new institution to manage/oversee Solar Commons trusts. We will assist Solar Commons projects engaging public art that seizes the opportunity to "make public" and "make visible" our energy infrastructure as a common good embedded in social and ecological relationships. Solar technology offers new ways to generate and distribute electricity and new ways to capture the commonwealth benefits of the sun's energy. The Solar Commons nonprofit facilitates research & education on community trust ownership models that maximize the economic benefit of solar for low-income communities. Solar Commons research uses tools of public anthropology to borrow from culturally and historically diverse forms of community trust ownership to innovative, iterable and scaleable Solar Commons models for the US public. Read about Solar Commons demonstrations projects, public art, and research/education below. The Dunbar School (established in 1912) was Tucson's first and only segregated school. In 1995, a local group called the Dunbar Coalition, Inc. took over the property to create a community center whose mission is "to increase awareness and understanding of the historic and cultural impact of people of African descent; to serve as a gathering place for diverse voices and cultures to dialogue about the past and create vision and direction for a more unified future". The school now hosts the Dunbar Barber Academy and other local businesses and serves as the site for the Dunbar/Spring neighborhood's community garden. In 2017, the Dunbar Coalition agreed to host the US's first "Solar Commons." With Pyramid Federal Credit Union, a local community development financial institution, the Dunbar School is demonstrating how, for twenty years, to create community trust ownership of a donated 14.5 kW solar array to produce savings (at $0.14/kWh) on Dunbar's net metered electric bill that will: pay for its own insurance, technical repairs and administration costs; provide an income stream to a Solar Commons escrow account held in trust by Pyramid CFU; and fund low-income housing weatherization for residents in the Garden District, a historically underserved area of the city. 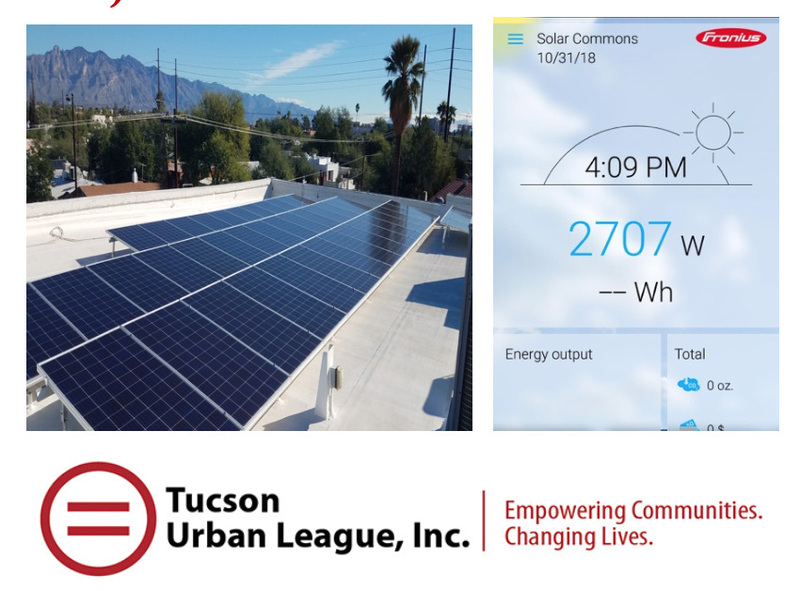 The Dunbar Coalition and the Tucson Urban League are demonstrating how to split energy ownership between the owner of the solar technology’s legal title (Dunbar School) and the owner of the sun's energy benefits (Tucson Urban League). In October 2018 SC1.0 was interconnected to the grid of Tucson Electric Power. Shortly we will post here: infographics of the Dunbar Solar Commons project and pictures of the public art MURAL (created by students at University of Arizona School of Art and children in the Tucson Urban League’s preschool and afterschool programs) making visible the Garden District neighborhood as the owner of the sun’s commonwealth energy. You will also here the open source legal templates of all the Solar Commons agreements (created by students at Vermont Law School Energy Clinic). We will also post names of the Arizona sponsors of the Dunbar Solar Commons. As part of the US Department of Energy's Solar In Your Community Challenge, Greenway Solar is building the second US Solar Commons in North Minneapolis thanks to the contributions of Xcel Energy electricity users to a local Renewable Energy Development Fund. Like SC1.0 in Arizona, Minnesota’s SC2.0 will generate a reliable funding stream to its urban beneficiaries, in this case, local youths interning as peer reporters in their community newspaper, North News, on neighborhood issues related to energy, climate change, healthy food and clean water. The Greenway Solar Commons uses a solar garden model (in-front-of-the-meter) but provides commonwealth energy benefits through the same community trust mechanism. Public art will make visible how residents of this historically underserved area of North Minneapolis are reclaiming the sun’s commonwealth energy benefits for the common good of their neighborhood. Stay tuned for updates on this project and a third (SC3.0) GreenwaySolar Commons in rural Minnesota that will serve new comers to the state’s farmlands, immigrants, women, and others learning poultry-based “regenerative” agricultural techniques taught by the Solar Commons beneficiary, Main Street Project. RREAL is a Minnesota nonprofit solar energy installer working in rural Minnesota since 2000 with a mission to alleviate energy poverty through solar energy. In 2015, RREAL and the Leech Lake Band of Ojibwe (LLBO) received a grant from Minnesota’s Environment and Natural Resources Trust to support RREAL's long standing efforts to deliver energy assistance to low-income households through solar energy. The grant supports 200kW of solar to serve the low-income energy assistance needs of the tribe. Because of restrictions in the jurisdiction of its utility provider, Minnesota Power, RREAL broke the 200kW system into 40kW arrays to be built both on and off the reservation. RREAL asked Solar Commons researcher, Kathryn Milun, to design a SC demonstration project with the 40kW array on RREAL's property. As a Solar Commons project, the array would be owned as a trust with RREAL serving as the trustee. The beneficiary would be the Leech Lake Energy Assistance Program which helps pay electricity bills for low-income members of the tribe. For the 20 year life of the solar panels, RREAL would use the revenue stream it receives for net-metered electricity to 1) maintain and insure the system; and 2) deliver an income stream to the Leech Lake Energy Assistance Program. Prof. Milun, along with the Vermont Law School Energy Clinic and a local team of volunteer lawyers worked on the legal documents for the trust. In June 2017, a Solar Commons feasibility study was completed (with support from the University of Minnesota Center For Urban and Regional Affairs [CURA] and graduate assistant Matt Grimley) outlining two specific SC community trust ownership models for RREAL. The feasibility study can be found here on CURA's website. The study provides: background information on the legal history that informs the Solar Commons model--from the US community land trust movement to Gandhi's development of the "village trust" model in rural India; an analysis of the public policy that could support Solar Commons trusts in MN and the US; a feasibility analysis of two SC community trust models designed and proposed to RREAL. While RREAL chose not to use the proposed Solar Commons model, readers can learn how the model might have worked from the feasibility study. Solar Commons build upon and expand the work of the US community land trust movement. We will post here forthcoming research on how community land trusts across the country can add solar arrays to their trust property portfolios. How can the Solar Commons model serve the needs of the many tribal communities--rural and urban--across the United States? What benefits can Solar Commons bring to low-income communities generally throughout the US? The Rocky Mountain Institute has been engaged to produce a study of the Solar Commons model in the US and on tribal lands. We will post it here on our website when its done. The goal of Solar Commons demonstration projects is to provide you with best practices and legal templates so you can build your own Solar Commons. We facilitate testing and refining of the Solar Commons model so that others, eventually, can build them in their communities. In our research section, we will post white papers, feasibility studies, case studies and open source legal templates created in collaboration with our university and community Solar Commons research partners. Solar Commons demonstration projects need public art that can tell the story of community trust-owned solar energy as a social-technology embedded in people's values, communities' livelihoods, and the earth's biosphere. As they becomes available, we will be posting images of the art created with local artists to support Solar Commons demonstration projects in the US. We also facilitate workshops and events that use art to educate by "making public" and "making visible" the socially and ecologically embedded relationships of community trust solar energy. We understand that the bigger picture of community-owned solar is a planetary one: many of our neighbors in the global commons of the earth's atmospheric carbon space are still without electricity and will be coming on line in the near future. Art can also help us see our local community solar efforts in the context of the social needs and ecological consequences of electricity generation in the global North and global South. A current workshop we are hosting includes an exhibit of three paintings commissioned by Solar Commons from indigenous artists with the Warli Art Cooperative in Maharashtra, India. The paintings are hanging in a local tea shop (The Snooty Fox) in Duluth, Minnesota. We plan to hold the workshop there soon with the help of local indigenous artists who have been helping us see the ecological and social consequences of fossil fuel energy infrastructure that is being built in pipelines across their reservations. Below is some background to the exhibit and workshop. The Warli are one of India’s most ancient and earliest agricultural peoples. “Warla” means “piece of land” and Warli art is made using the sustaining elements of their rural lifeworld: white rice paste against the red soil fertility of earth. The stick figure art form, still visible on 10,000-year-old petroglyphs in central India, depicts sacred relationships among Warli and the natural world as well as scenes of everyday life. Warli painting was traditionally done by women on inner walls of village huts for important rituals like marriage and harvest festivals. In the 1970s village men applied the form to canvas so it could be sold in art markets and bring income to forest communities experiencing the encroaching impacts of India’s industrialization. Like many indigenous peoples in South Asia, the Warli live in remote, mountainous forest areas and are among the 300 million Indians—one third of India’s population--who do not yet have electricity. THESE PAINTINGS were commissioned in the summer of 2016 from a Warli Art Cooperative of men living in Maharashtra villages recently electrified by solar microgrids. I heard that the Warli were using a strategic community solar ownership model aimed, like the Solar Commons model we are building in Duluth, to link solar electricity to social equality. The Warli are experimenting with owning their solar array as a community trust requiring half the Board of Trustees to be women and thus empowering women’s role in village governance. Knowing this, I requested that the artists show us how the new force of electricity is impacting village life. These three paintings are their response. Before and after scenes show women who used to walk up and down the mountainous terrain for hours everyday fetching water for their families and crops; the women now fill their water jugs at a central village pump. Children can be seen reading and watching internet and TV screens at home. Villagers socialize outside at night beneath a lamp without fear of unseen forest predators. The artists help us see the energy infrastructure, where the electricity comes from as well as the work, life ways, social change and social equality it enables—all of it embedded in a world filled with the diverse animals and plants that the Warli revere. INDIA is in the process of bringing electricity to all its 1.3 billion people and as it does, it will use the resources it has at hand. Solar is a good and clean source of electric power for remote villages, but coal is abundant in India and will play a big role in powering India’s expanding electric grid just as it has in Europe and the US. New coal-burning power plants now send electricity through India’s transmission grid expanding high and low across the countryside to run industrial cities, bring light to towns, pump water from distant wells, cook food without dangerous fumes, and connect hamlets to the global internet. Coal often lies beneath the forested hills of indigenous peoples’ villages. Just as we have seen in the US with the Dakota Access Pipe Line, gaining access to new fossil fuel sources often makes electricity producers part of an extractive industry reaching further into parts of the earth where indigenous peoples and their worldviews hold a tenuous sovereignty. SEEING ELECTRICITY in the world around us means seeing the coal mines, oil & gas pipelines and overhead wires as well as the places, peoples, lifeways, worldviews, ownership structures and social justice issues that give form to our modern electrified planet. In the mountains and hills of both Maharashtra and Appalachia, taking coal out of the ground brings pollution and health problems along with jobs for local peoples. Burning coal for electricity is also the single greatest threat to the earth’s climate system: emissions from coal-powered plants fill the earth’s atmosphere and fuel global warming; methane from coal mining is one of the most potent global warming gases. THERE IS ONLY SO MUCH CARBON SPACE LEFT IN THE EARTH'S ATMOSPHERE if we want to hold on to the stable climate that has supported human agriculture and societies for tens of thousands of years. As India electrifies, the US will be sharing the earth’s carbon space with millions more earth citizens. Americans, the second largest consumers of electricity after China, currently use 1843 watts of electricity per person--compared to China which uses 474 watts and India which uses a mere 152 watts per person. (1) In the US, our high-energy lifestyle uses climate-changing fossil fuels to produce most of our electricity. Coal, the most harmful fuel, powers thirty-three percent of the US electric load. In Duluth, however, we are significantly above the national average: we use coal to make nearly seventy percent of our electricity! COMING SOON: SEEING ELECTRICITY IN DULUTH: WHERE IT COMES FROM, WHAT IT MEANS FOR OUR WORLD A public art project collaboration of Snooty Fox and Solar Commons learning through Warli art to see into our energy infrastructure--where Duluth’s electricity comes from as well as the work, life ways, social change and social equity it enables. This invitation to public art will provide a way for Duluthians to see ourselves and our electricity system living next to our generous Lake Superior and among the diverse animals and plants that we so value. (1) Information on American electricity use comes from US government’s Energy Information Administration (http://www.eia.gov/energyexplained/index.cfm?page=electricity_in_the_United_States ); world figures on electricity use are from public domain material from the CIA World Factbook website (https://www.cia.gov/library/publications/the-world-factbook/index.html ). Information on fuel sources of Duluth’s electricity come the website of our investor-owned utility, Minnesota Power at (http://www.mnpower.com/CustomerService/CostDisclosure?TargetFrame=_blank ) Minnesota Power reports coal at 56.8 % of its fuel mix but also notes that an additional 16.2% of its fuel sources come from purchases from other coal, nuclear and natural gas power plants throughout the region. Solar Commons research is currently underway in partnership with the Vermont Law School Energy Clinic and other university researchers. Our website will make these research results available to open a pathway for low-income community trust-owned solar in the United States. You can expect white papers, case studies, market and feasibility studies, and a law review article by the faculty, students and community partners innovating Solar Commons community trust ownership models. A short book of public scholarship by Kathryn Milun will tell the broader story of Solar Commons and community trust ownership for community empowerment. We recognize that community-owned solar is an important but often overlooked area in our energy transition. Individual rooftop and utility scale, investor-owned solar are and will be part of our clean energy landscape. However, the diverse benefits that can come from capturing solar commonwealth for underserved neighborhoods through the ancient and contemporary tool of community trust ownership remains to be explored. In the fall of 2016, Solar Commons researchers organized a conference entitled Social Change Through Community Solar. With sponsorship from the University of Minnesota and others, a speaker from India talked about his work installing community trust solar for remote, indigenous villages in Maharashtra. Local community solar developers and installers and a public artist/trained solar installer also spoke about their work.